Redlands East Valley will have new nonleague opponents next year and won’t have to travel far at least for a couple of them. Coach Kurt Bruich said the Wildcats will play Upland and Etiwanda, and need to find a third opponent. 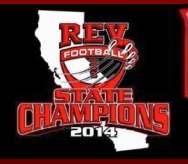 This year, REV played road games against Chaminade, St. Bonaventure and Rancho Verde. A little more than a month ago, Redlands East Valley’s football team won its Division II state championship. Now, you don’t have to wait until next football season to buy your championship gear, you can order it now. Apparently, they will be available for pickup on February 13, available in red or black. Also available through the team’s web site are the Citrus Belt League champion gear, which I’m guessing is not quite as hot a seller as the state championship gear. For much of the year, Joey Harman has been the primary running back for Redlands East Valley. In part that’s because Taimon Faimalo broke his foot in a scrimmage, and Jonathan Clark broke his leg in Week 2. But while Harman has excelled, rushing for 1,086 yards and 10 touchdowns, help is on the way. Faimalo played for the first time all season in last week’s win over Carter, mostly in the second half. “That’s a good defense and they knew we were going to run,” said REV coach Kurt Bruich while praising Faimalo, who rushed for 42 yards on eight carries. Now, there’s word that Clark, who carried 12 times for 144 yards and two touchdowns in less than two games, is returning. Clark is jogging and might be able to play next week, assuming REV gets past Riverside North tonight. But REV might also get help from Clark’s younger brother, 5-foot-10, 177-pound freshman Gabe Clark. Bruich has submitted the paperwork so Gabe can play varsity, and Bruich said he could get some carries this week. “This kid is a manchild,” Bruich said.